Coordinating your Divemaster Mapping Project requires some tips to make it run smoothly, and most of all make the time you put into it effective and productive. 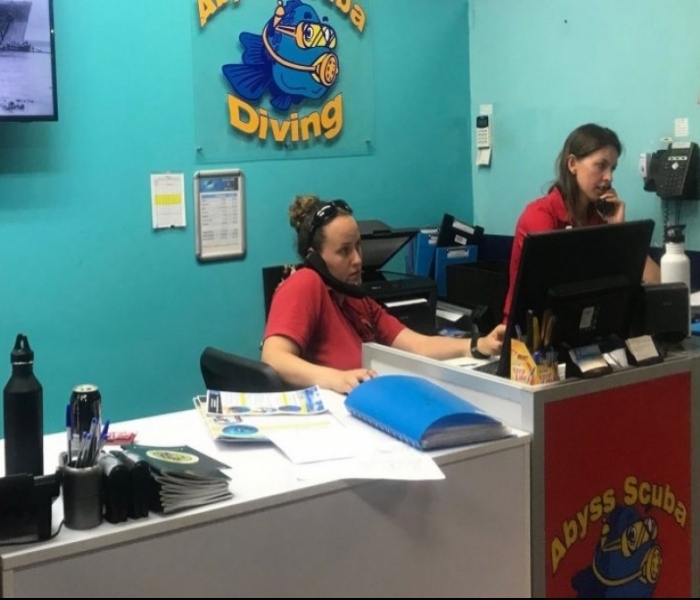 If you want to get the most out of your efforts and need some good Divemaster Mapping Project Tips to help you along the way, then keep reading to find some fantastic tips to base your project plan around and you will surely succeed. Understanding the scope of the project will allow you to meet the expectations of the Instructor. By scope, I mean the area, content and detail that you are expected to include in your Mapping project. You need to understand that the detail you can include is dependent on the area you will map. It is kind of like a see-saw. The larger the area, the less detail you would be expected to include. The smaller the area the more details and so on… Common sense really. A really good way to impress your Instructor is to find out the site they want you to Map, and then print out some aerial views of the site prior to the Project Brief. This way you can get a definitive area you are expected to map and can use the print out as a discussion point. 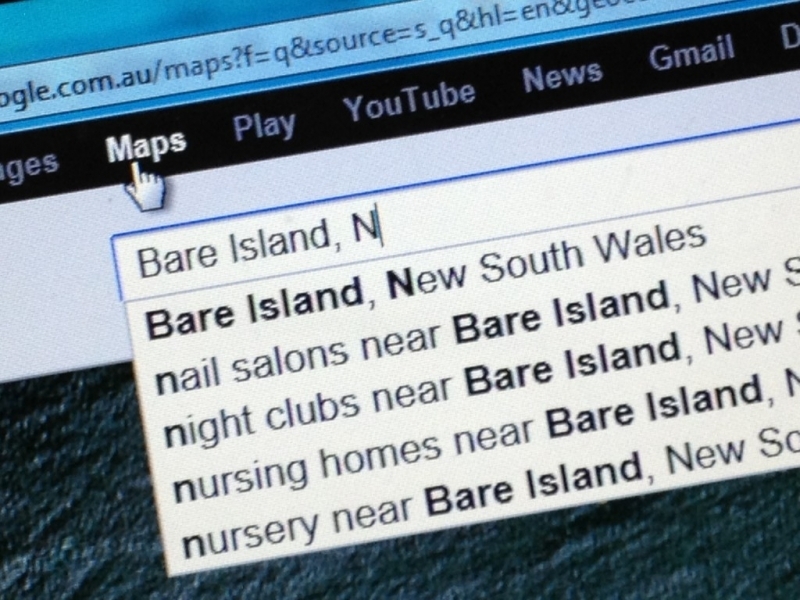 Google Maps is ideal for this. If you think using the internet is cheating, then you need to move into the 21st century. Why spend hours of your team’s time doing something that should just take 20 or 30 minutes. Google Maps is one of the coolest tools the internet provides to help create the basis of good, to scale map of the area you have been allocated. Use it! There are some really amazing e-tools out there, but probably the best one I know of is Google maps. It will give you a good scaled version of the shoreline you are mapping and maybe even some rough reef lines to use as a guide for underwater contours. This is definitely worth exploring and utilising during your project. If you haven’t already, just select Google Maps while on the Google.com and then type in the name of the area you are keen to map. Make sure you are on Satellite View so you can see the photos rather than just the vector map. 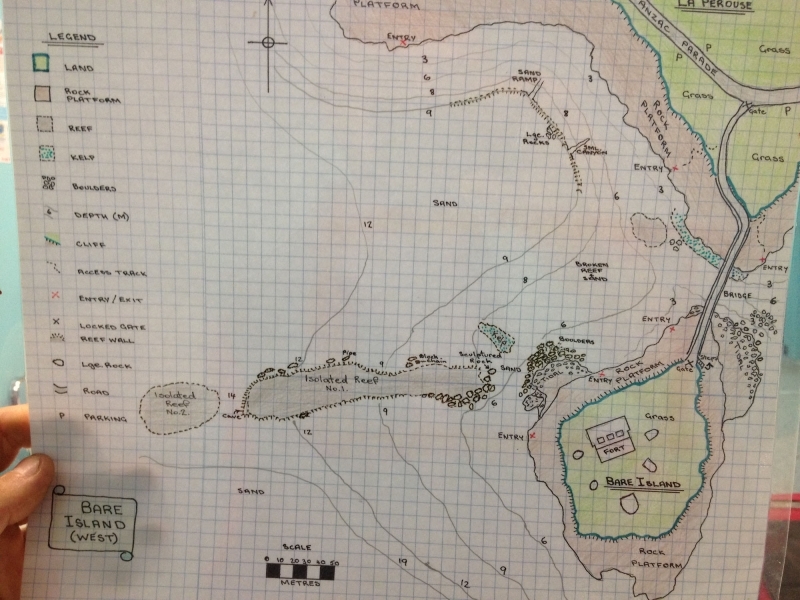 Once you have the area in view on the computer screen that you have planned to include in your project, trace the outline of the shore line and surrounding area to form a base map to use when you start plotting the underwater elements. Download this page to assist with your base map. Trace or free-hand the shore line and surrounding area onto this paper to form the basis of your map. If you do it in pencil first, and the use a black felt tip pen to do a final outline, it will photocopy really well to form the perfect base map. Photocopy this or scan it and give a copy to everyone in your team. Print out 5 or so copies to use to scribble on during your first ocean recognisance session. 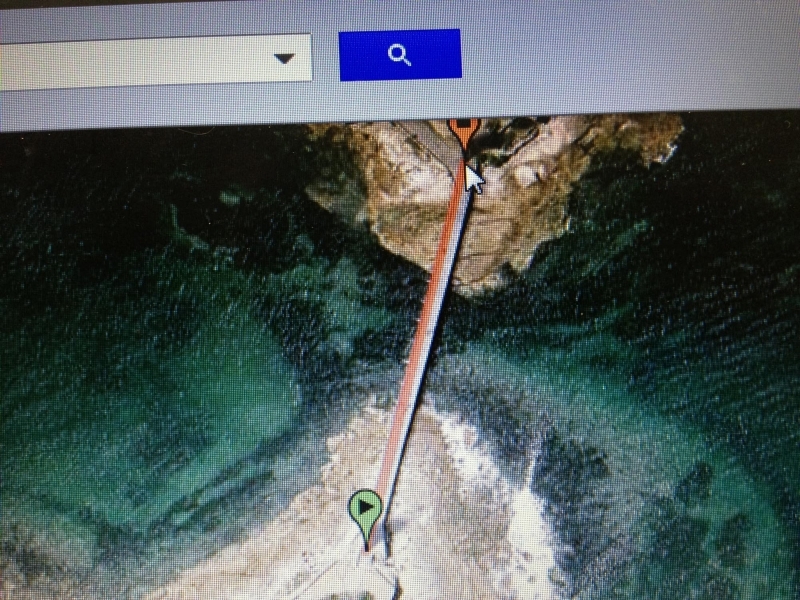 Google maps has an awesome tool called the Distance Measuring Tool. This tool allows you to gather data on different distances on Google maps. Prior to heading out for you’re your Ocean Recon session, measure out some basic distances on your map just to give you an idea of the scale of the map you are creating. For instance in this map of Bare Island, we have measured that the length of the bridge down to the dive site is 111m long. Cool to know because if we need to plot underwater distances on the map we can use that to compare it to. Do this with some distinct land marks to make your map as correct to scale as possible. Now that you are armed with your base map (which you should have already printed off several times) you need to develop a plan of attack for your first Ocean recon session. Get together again with your team and discuss things such as what methods you are going to use to survey the underwater area, what tools you will need and who will be doing what. The entire concept of this project is to see how well you all work together in a team and to develop your leadership and problem solving abilities. So work it, baby, work it! Prior to heading out, I would suggest you discuss what you all think the dive site looks like based on any prior knowledge you have of the site. On one of the copies of the base map, draw a mud map of what the team assumes the site looks like (I say assumes because it isn’t until you actually map a site that you really know what it looks like from a birds-eye perspective) and then mark out some well recognised underwater landmarks. If you don’t know of any then you will need to simply dive or snorkel the site prior to just get a feel for the site and what you want to include. During the first Ocean Recon Session if you buoy these landmarks (Either by deploying a dSMBwith a reel line or finger spool and tying it off on the reef / landmark) you can then use this surface mark to gain some visual reference to where it is in reference to your base map. One of the most common mistakes in mapping is actually understanding exactly where you are while underwater. If you plot reefs and landmarks in the wrong place on your map, you map will not be able to used effectively by fellow divers. Which is kinda the point, right? You will be able to get out of the water, get the base map you created first as team during this step (Step #5) and then correct it based on where each marker is. It may be a good idea to have different coloured markers to distinguish the differences between landmarks. Remember that you will probably be surprise to where they actually are to what you thought before. Once you have established some distinct underwater landmarks that your team wants to include in your map, head out to the site and get wet. To dive or not to dive, this is the question… You will need to ask yourselves this question for your first Session. Well the first in-water part of this session anyways. Dive and understand the site. Remember, you want to be able to use your final map to show your customers and fellow divers the dive site. You will be utilising this map during your Divemaster Course when you are gaining experience guiding dives. You should be able to use this map during your Dive Brief during these sessions. So when you go for the first dive for this project, I would just follow the standard path divers follow, but just pay more attention with the compass headings of the reef lines and the depths each are at. (Both at the top and the bottom of the reef lines or walls). If you trace a rough outline of the base map onto a slate you will be able to plot these heading and depths onto the slate. 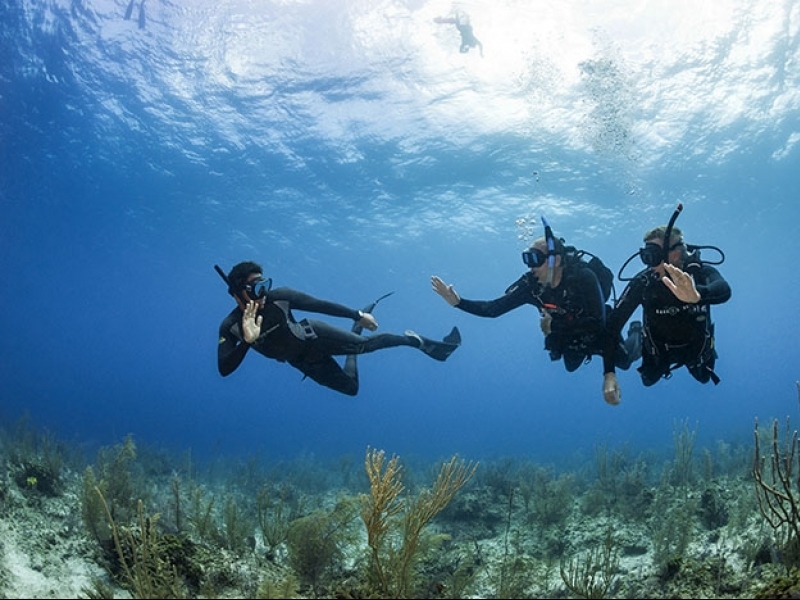 FOR SAFETY: If you have not yet been taught how to deploy a dSMB you should ask your PADI Instructor to demonstrate and observe you all doing it a few times in one of the earlier sessions. It can be tricky and also potentially dangerous if not done right. I have seen divers dragged to the surface because they where entangled in this spool line when deploying it. Better safe than sorry! When you exit, get together as a team discuss how you went. If it was the first time you all have dived there, then chat about the references you all used when navigating around, and also any particular landmarks that you thought might be interesting to include in the map. If you buoyed any of these during the dive, you will be able to get a good feel as to where they are now, by looking at the markers from the surface. Get yourselves to a high vantage point so you can see the rough area they are floating in relation to your base map. You will probably be able to just plot their position on one of your base maps. Once the positions are plotted, you can usually just join the dots based on what you experienced during the dive. You can see on the Map created for Bare Island, we used the markers/ dSMB to plot the position of some basic points of the reef and also used them to make out some depth contours as well. Once you have started to form a base underwater map, you can them continue to develop the map to ensure it is as accurate as needs be. The best way to do this is to just photocopy the adjust base map each time you finish another recon dive, to allow the team to plot additional info. Then photocopy again and again, each morning prior to heading out to develop it again. You can’t expect to get a perfect map in just one day of dives, nor do we want you to do it in just one day. Take your time to work as a team and until you are all happy with the outcome. Once you have the best base map you feel you can get, then you can transfer the map one last time. Use a window and larger piece of paper to do the transfer. Slightly thicker board works best because it will last the longest. Remember you will use this final map each time you do a brief there. You can get creative and include some soft pastel colours, and different shades and thickness lines to differentiate the shore, reef and sand contours. Laminate the map once you are all happy with the outcome, and present it to the Instructor knowing they are going to be impressed with what you have done. Good luck and we look forward to seeing copies of all your mapping projects. It is all about teamwork, so work as a team and don’t attempt to dominate the group. Planning and preparation should take just as long as execution. So take your time prior to heading out for each in water session to ensure your time is effective. Gather volunteer helpers who are keen to assist you during your ocean sessions. The team can then delegate some of the more easy tasks to the helpers to speed out the process. Don’t attempt to map an area that is too large in too much detail. Be realistic with the groups goals for each session. This will keep moral up and keep not only your enthusiastic but also your volunteer helpers. Don’t cheat and just look up a complete existing map online. Just use google maps to create the base map first then use your own developed mapping techniques to fill in the gaps underwater. Don’t get stressed when things don’t go your way. There will be sessions that will not be as productive as you had anticipated. So just role with the punches… re-asses and redevelop another plan to not make the same mistakes the next time. This is what the project is all about. Practice using the dSMB’s under the supervision of a PADI Instructor prior to doing it during this project. Don’t stop developing the map when you hand it in to the Instructor. Each time you go out to a dive site, you would be creating a map to improve your current base map. If you dive 10 times at every site in the area, you should have some pretty cool maps to use when you start working as a Divemaster. Your customers will love you for it! Most of all: HAVE FUN and enjoy the experience. You will get out of it what you put in, so don’t minimise the value of this portion of your training. It is loads of fun, so enjoy!